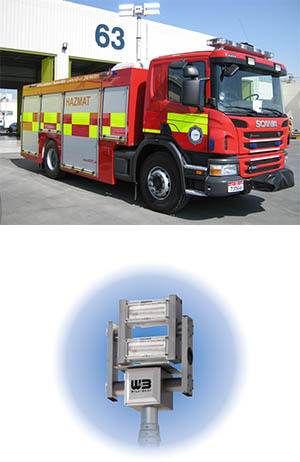 Will-Burt's Night Scan Chief is a roof-mounted, fold-down light tower which requires no interior vehicle space. It is typically used on medium-sized rescue, pumper rescue, service and utility vehicles or smaller wrecker vehicles. The Night Scan Chief provides up to 140,000 lumens of scene light and features a self-contained air system ( no external air-supply needed).Available with all DC (12/24VDC) operations, the Night Scan Chief does not require a generator or inverter. The NIGHT SCAN® Profiler is a space-saving scene light option for the Night Scan Chief featuring 1500 watts of AC light. 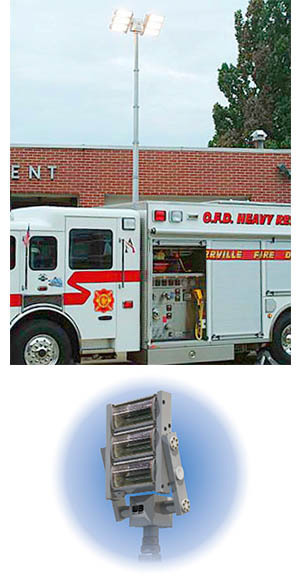 Measuring only 21" wide, this compact scene lighting fixture enables installation on new or existing Emergency Services vehicles with limited available mounting space. Will-Burt's Night Scan Profiler is also available in DC power, operating entirely from the vehicle's standard battery system which is ideal for vehicles without a generator. Will-Burt's Night Scan Powerlite is a roof-mounted, fold-down light tower which requires no interior vehicle space. It is typically used on scene lighting and illumination on heavy-rescue vehicles, mobile command centres, airport vehicles or large wreckers. Opposable light fixtures provide equal scene lighting forward and backward at the same time - 360° of light. Delivering up to 210,000 lumens of LED or halogen scene light, the Night Scan Powerlite is ideal on any vehicle where maximum scene lighting is required. The Powerlite can be elevated with truck air or an optional on-board compressor. The NIGHT SCAN® Profiler is a space-saving scene light option. Instead of two banks of lights, the Powerlite with Profiler provides widespread scene lighting with a single 3 light stack that is only 21" wide. While the profiler is narrower in size, it provides a full 4500 watts of scene lighting in only 45 seconds with the push of one button. The Will-Burt Night Scan Xtreme is a roof-mounted, fold-down light tower which requires no interior vehicle space. 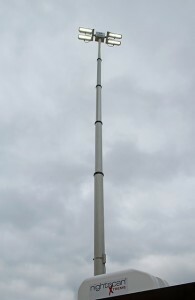 It has been designed for applications where maximum height and extensive scene lighting is necessary such as hilly terrain, locales with mature trees or urban areas with tall buildings. Opposable light fixtures provide equal scene lighting forward and backward at the same time - 360° of scene light. The Night Scan Xtreme can be elevated with truck air or optional on-board compressor. When the situation requires maximum elevation and scene lighting, Night Scan Xtreme is the light tower you need.